The ongoing process aimed at improving fish passage and temperature control at Detroit Lake has led to a new line in the sand being drawn. The Marion County Board of Commissioners voted 2-0 on Aug. 8 to have the county counsel intervene in the lawsuit the Northwest Environmental Defense Center has filed against the U.S. Army Corps of Engineers. The Corps is working to help solve the fish and temperature issues identified by federal fish and wildlife officials in a 2008 “biological opinion.” The lawsuits followed because the Northwest Environmental Defense Center and other groups felt the Corps was not moving fast enough. And the commissioners – as well as the city of Salem, which also has intervened – don’t want the Corps to move at all because of the project’s economic impacts in the Santiam Canyon and on downstream water supply and agricultural concerns. “No action, that’s the option I prefer,” veteran Commissioner Sam Brentano told Our Town. Brentano, a Sublimity resident, was joined in the vote by Kevin Cameron. Janet Carlson was not present, but Jolene Kelly, the county’s public information officer said Carlson supports the action. 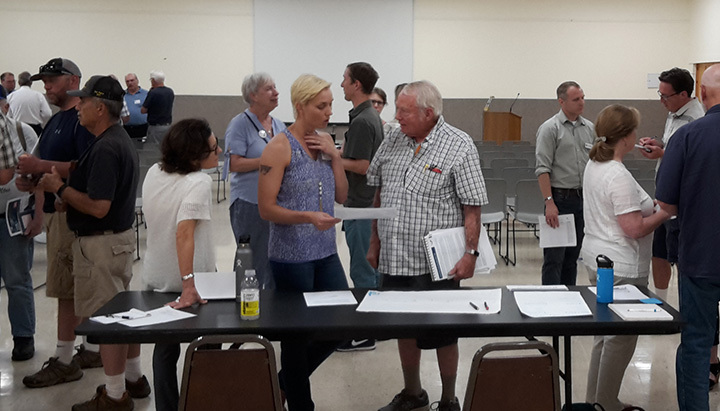 The board of commissioners vote came two days after Brentano participated in a public outreach session at the Stayton Community Center that was attended by approximately 75 people. 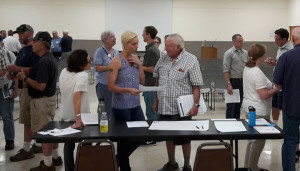 Sessions also were held Aug. 22 at the Gates Fire Hall and Aug. 23 at the Oregon Department of Fish and Wildlife in Salem. The problem is clear: The Corps is under orders to find ways to get endangered chinook and steelhead stocks down the North Santiam River and control temperature better in the lake to boost fish survival rates. Solutions are harder to come by as was apparent during the Corps’ Aug. 6 Stayton presentation by Jeff Ament, the project manager and Kelly Janes, an environmental resource specialist. Their briefing, which included 23 slides, took nearly an hour, and focused largely on alternatives that have been taken off the table. While answering the hypothetical question of “what other options have you guys considered?” the big question for those in the Santiam Canyon – and downstream – is will the lake be drawn down and for how long? Audience members chafed a bit at the length of the presentation and the fact that workshop organizers had not planned for an open question-and-answer session, which had been the process during outreach sessions during the winter. Instead, the Corps had set up tables at the rear of the room with experts standing by to talk about specific issues the project has raised. “Are you telling us what you are doing or listening?” asked one audience member. Janes said the Corps is doing both. Then, the audience member asked if residents can have an impact, say, by calling their Marion County commissioner. As an example of the Corps’ willingness to listen, Ament cited efforts to find alternatives to the Mongold day-use area of Detroit Lake State Park for construction staging because of the recreational impact for lake users. “We are trying to meet the needs and minimize the impacts,” Ament sued, “and we already are being sued” by environmental groups. During an Our Town interview after the board’s decision to intervene, Brentano continued to express his frustration over the meeting. Key elements of the Corps’ plan to date include erecting a tower that will remix the lake water to moderate the temperatures and building a fish collector barge the size of a football field to help move the fish. Key questions that remain to be answered are whether to erect the tower in dry or wet conditions, with a higher lake level making the work riskier and costlier… and how many years the lake must be dry for the construction project. Current estimates are either one or two years. The Corps plans to issue an environmental impact statement in the spring of 2019, with more public outreach planned. Construction could begin in 2021 on the temperature control phase of the project. The second phase, targeting downstream fish passage, would be built in the 2025-28 range. The approximate cost of the project is $100 million to $250 million, said Tom Conning, public affairs specialist for the Crops’ Portland District. No funding sources have been revealed.